Matula Tea is ONLY available online. DHL, Fedex or Aramex door to door delivery within 5-7 business days. Since Matula Herbal Tea was introduced to the market in 2006, we have treated more than 20 000 customers and our success rate has been in excess of 98%. Therefore we are happy to continue offering our product with a Money Back Guarantee! If you have been tested and diagnosed by your doctor confirming you are infected by the Helicobacter Pylori bacteria somewhere in your digestive tract, you must complete the 30 day treatment course of Matula Herbal Tea exactly as instructed. In the event that you are not feeling well and suspect the Helicobacter Pylori bacteria is still present and active, you are requested to be retested for the presence of the bacteria by means of a HPSA Test (H.Pylori Stool Antigen Test). Please email us a copy of your doctor’s ‘Before and After’ HPSA test (H. Pylori Stool Antigen test ) or a GI Map Stool Test, including your order number to support@matulatea.com which should confirm that the Helicobacter Pylori has not been fully eradicated and that you are still infected. Once we have received the signed and dated HPSA test or GI Map test written or typed in English and we will refund you your total purchase price. ** The HPSA Test should only be done 4 weeks (between 28 and 32 days) after completion of the course. The 4 week delay is requested due to the fact that the digestive system needs this period of time to eliminate any dead Helicobacter Pylori bacteria). N.B. We do not recognize an H.Pylori Breath Test for guarantee purposes. 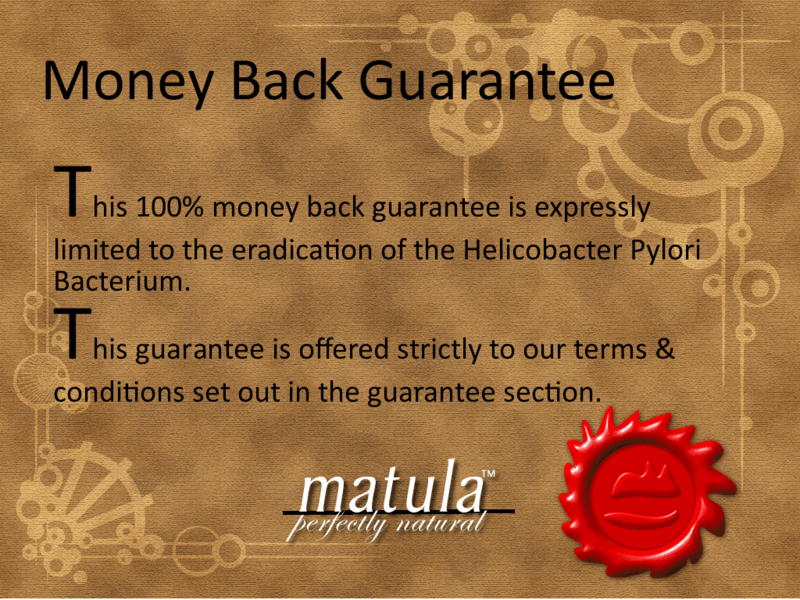 • Please note that this guarantee is valid only for purchases from our website: www.matulatea.com. • We will refund you your purchase price less the shipping fees. • The MONEY BACK GUARANTEE EXPIRES AFTER 6 MONTHS OF PURCHASE. This is due to the fact that it is possible to be reinfected by a spouse, partner or family member, who may be infected by H. Pylori. In addition to our money back guarantee, we also offer our support guarantee. This ensures that you have unlimited access to our dedicated health team, who offer their full support and advice to you, while you are on the treatment and until such time that you are well again.